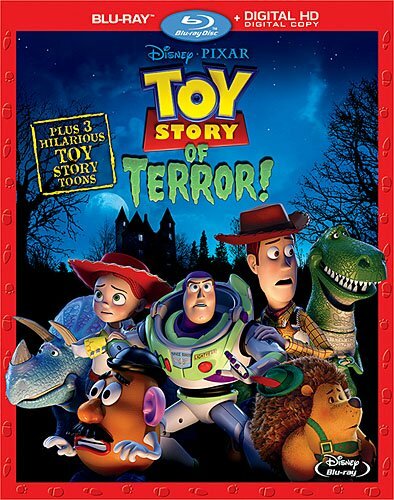 Toy Story of Terror is a half-hour TV special that takes place after the events of Toy Story 3. All three movies are fantastic, and this TV special is no exception. It feels like a mini-movie, with the original movie cast returning to do the voices. The animation is also movie-quality, so there was definitely no skimping on production values. The plot find our lovable toys in a motel room at night. Curious, some want to explore, and of course the others follow. Then things start to go wrong. One by one each of the toys begins to disappear and before too long the remaining toys find they have a mystery to uncover if they want to get their friends back before morning when Bonnie her mother head off. Since this is a family-friendly program, there obviously isn't anything gruesome here, but they do a good job of presenting the right atmosphere for a family horror show, making it slightly scary but not terrifying. Also on this disc are deleted scenes, Toy Story related cartoons, and a making-of featurette. The cartoons are hilarious and are made in a more classic animation style. There's even a full-length commentary which is both entertaining and informative. Some commentaries are totally boring, but this one is worth listening to. Also included is a digital HD copy for watching on phones or computers. This is a good release, and it's not even $20-$30 like most blu-rays. The retail price is only $14.99, and Amazon has it for even cheaper. Even if you don't buy, I'd say it's worth a rental.